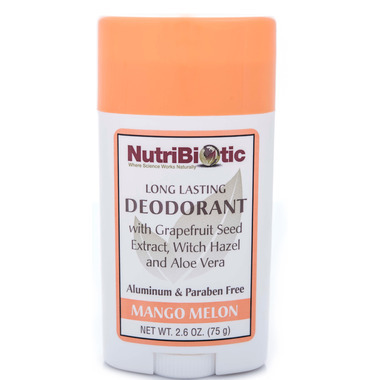 NutriBiotic Mango Melon Deodorant is a long lasting deodorant containing grapefruit seed extract, witch hazel, and aloe vera. Ingredients: Deionized water, propylene glycol, sodium stearate (from palm oil), witch hazel distillate, aloe vera gel, grapefruit seed extract (GSE), tangerine oil, peppermint oil, lemon oil, and lime oil. As far as natural deodorants go, this one isn't bad. I'm one of those people who need strong stuff, and natural deo doesn't usually work on me. But this one will, provided it can dry on my armpits. If they stay wet, it won't work. So if I have a shower at night and put it on, I'll stay smell free through the whole next day because my arms are up at night and drying. If I shower in the morning and don't dry my armpits well, I can expect to stink in a couple hours.